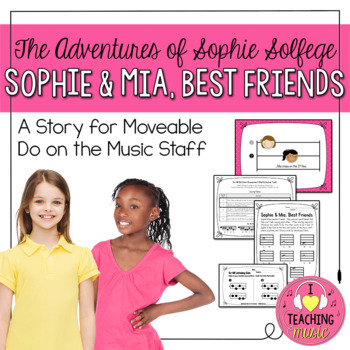 The Adventures of Sophie Solfege series was born out my need to make the abstract concept of placing solfege patterns on the music staff a little more concrete for younger students. My schools use moveable do, so I teach my students the relationships between the notes when they are placed on the music staff. 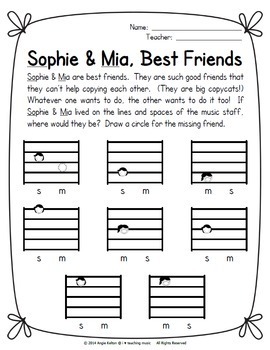 This allows the students to move the solfege patterns around, but keep their relationships to one another intact. Creating a story that mimics the relationships between notes makes this experience memorable for students. *This lesson is part 2 of the Sophie Solfege series. 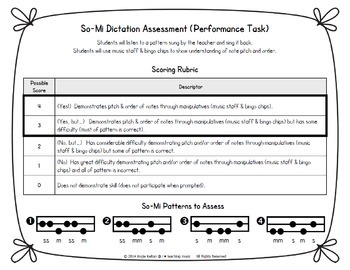 It is meant to introduce students to So & Mi on the music staff. 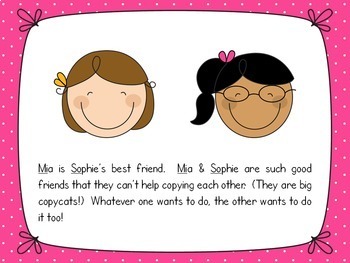 Students are introduced to Sophie Solfege (So) and her best friend Mia (Mi). This presentation also includes the slides found in Chapter 1: Sophie Climbs the Ladder. Meet Lana, Dorian, & Reymond in subsequent lessons (coming soon!). *Product states that it has 69 pages/slides - this is just in the 3-line version. You're actually getting double that when you consider the 5-line version is included at no extra charge!